Matt Loveridge's Art Blog: "You are what you eat"
My first assignment for school. We were working with the phrase you are what you _______? I decided to stick with the obvious you are what you eat. 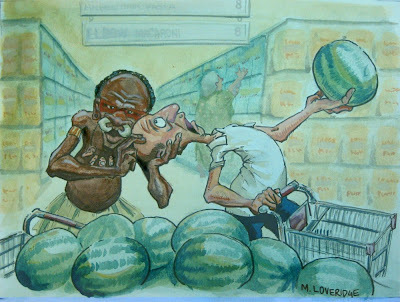 I was wondering where a cannibal would do his shopping, probablly walmart, they have everything there. I'm glad that the photo reference worked out for you. Next time you need a middle-aged bald guy to bend over backwards I'm your man.